The CROC company and the Ministry of Defense of Russian Federation invite the schoolchildren of the 9-11th years of education in Moscow and the Moscow region to take part in a school programming championship. The championship is called Coder-Strike 2014. The championship will be held based on Codeforces. We aim to support talented high school children, help to form the community of programming enthusiasts, develop future IT professionals. The modern industry offers scientific challenges that cannot be solved without profound knowledge in the field of algorithms and data structures. We want to provide out participants with potential ways of development of with the opportunities that open in front of high qualified professionals. You can participate if you study at 9-11th school year of one of a high school of Moscow or Moscow region. You should also be over 14 years old at the moment of registration to the championship. In order to become a participant of the championship, you need to register before you take part in the qualifying round at http://crocok.ru/championship/. You should submit the participant application form to take part in the championship officially. The championship finals will take place on April, 22 in the CROC company office on 5, Volochayevskaya street. The finalists will have an excursion along the company office an meet the leading specialists of CROC and the Ministry of Defence of Russian Federation. The time of the finals will be specified later. The award ceremony will be on May, 20-23 on the exhibition by the Ministry of Defense called 'Complex Safety'. All the participants who make it to the finals get souvenirs from the CROC company and the Ministry of Defense of Russian Federation. All the willing users can participate in the championship out of competition. In this case the application form is not required. The sorting rounds and the finals will be Codeforces rating rounds. Only for Russian？ Will there be an English version post? I can't read it right now. 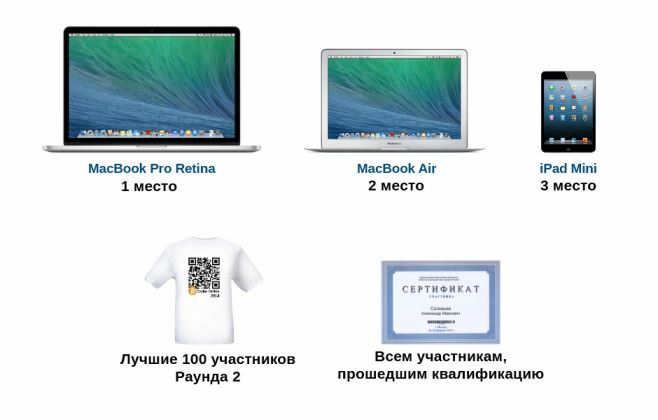 Moreover, prizes are only for school pupils from Moscow, not for all Russians. It is always the same when you see that competition is sponsored by "Krok". The English name of this company — "Croc" and not "Krok". Only i need is PARTICIPATE on any contests. I am not good at PROGRAMMING. I need some experience and why only Moscow? If it was worldwide contest i would PARTICIPATE in it using all my EXPERIENCE. P.S. : Words with capital letter are need to me. Will be any English Problem set ? Yes, you will be able to take part unofficially. Do the qualification rules apply for out-of-competition participants as well? I mean, in order to participate in Round 1 (as an out-of-competition person) should I participate in the Qualification round? That's great~BTW,is the score system of this competition the same as the usual contest? Will online versions of the contest be common(div.1 and div.2 compete together)? What will be the estimated difficulty for every round? How to register in English version form? Are there going to any rated events during coder-strike? i guess there wont be (atleast CF rounds). "The sorting rounds and the finals will be Codeforces rating rounds." Server time: Apr/20/2019 16:24:38 (f2).